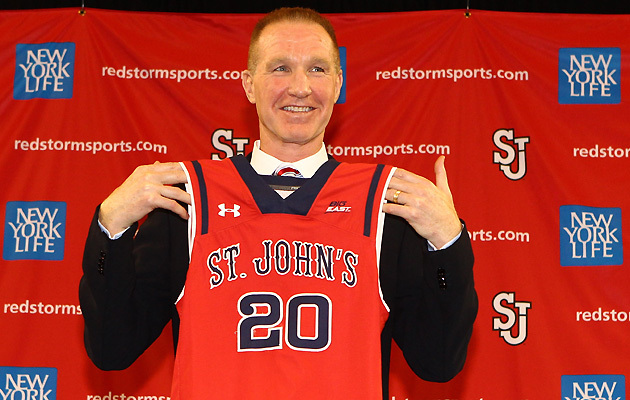 Chris Mullin rounds out his first recruiting class at St. John's with the commitment of guard Marcus Lovett. In the middle of April, Marcus LoVett tweeted a list of eight schools, ordered based on their appeal to him. The list read as follows: St. John’s, Memphis, Illinois, DePaul, Pitt, UC-Irvine, UNLV and San Diego State. About a month later, the top-ranked school won out, as Lovett announced he has signed with the Red Storm. Lovett, who posted a picture of himself with his National Letter of Intent late Wednesday night, was the highest-ranked guard in the Rivals150 who had yet to choose a school. St. John’s had been considered one of the strongest contenders to land LoVett prior to the school’s parting ways with former coach Steve Lavin. Yet in an interview with SportsNet New York, Lovett praised the Red Storm’s hiring of Chris Mullin, saying “I just think that he could get me to where I want to be.” In the end, LoVett elected to join Mullin’s first recruiting class. LoVett played at Morgan Park (Ill.) High this season after transferring from San Gabriel (Calif.) Academy. He scored 45 points in a loss in the semifinals of the state playoffs and shined in the Chicago Public League. At 6-foot and 170 pounds, LoVett,, nicknamed “Bright Lights,” is highly regarded for his quickness, tight handle, court vision and ability to make plays in transition. Mullin wasn’t able to bring his top two targets—power forward Cheick Diallo, who chose Kansas, and guard Brandon Sampson, who picked LSU—two New York, but that doesn’t mean he has failed with his first recruiting class. He successfully landed three-star guard Malik Ellison, three-star power forward Darien Williams, and three-star center Yankuba Sima, plus three transfers—forward Tariq Owens from Tennessee, wing Durand Johnson from Pittsburgh and guard Ron M’Voika from Missouri State. The way he’s upgraded the roster since taking over, combined with the returns of guard Rysheed Jordan and big man Chris Obekpa, inspires optimism about what the Red Storm can accomplish in his first season. LoVett’s commitment means there are only two players ranked in the top 100 of the Rivals150 who have yet to choose a school: Five-star center Thon Maker and four-star power forward Noah Dickerson.